Hyundai Motor Co. announced today that it will begin series production of its hydrogen ix35 Fuel Cell vehicle for public and private lease by the end of 2012, becoming the first global automaker to begin commercial rollout of zero-emissions vehicles. In December 2012, Hyundai will begin production of the ix35 Fuel Cell at its Ulsan manufacturing facility in Korea, with a target of building up to 1,000 vehicles by 2015. Hyundai has already signed contracts with cities in Denmark and Sweden to lease the ix35 Fuel Cell to municipal fleets. Beyond 2015, Hyundai plans limited mass production of the ix35 Fuel Cell, with a goal of 10,000 units. "The ix35 Fuel Cell is the pinnacle of Hyundai's advanced engineering and our most powerful commitment to be the industry leader in eco-friendly mobility," said Vice Chairman Woong Chul Yang, head of Hyundai R&D. "Zero-emissions cars are no longer a dream. Our ix35 Fuel Cell vehicle is here today, and ready for commercial use." 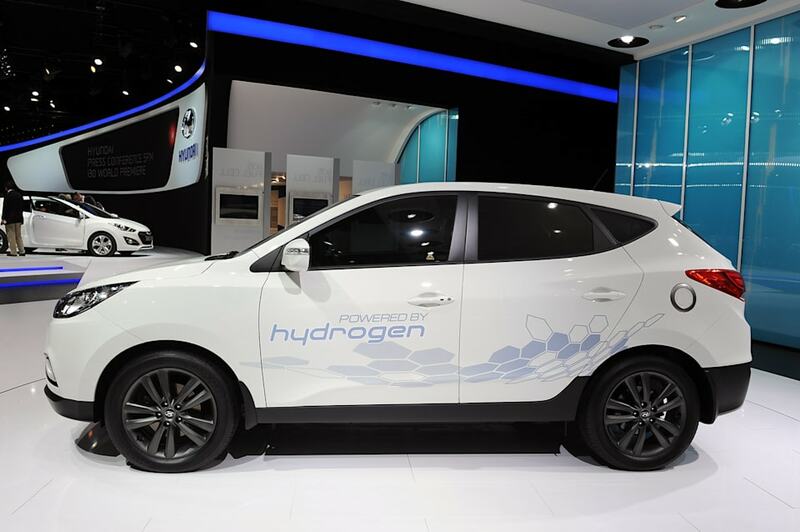 Built with proprietary technology, Hyundai's ix35 Fuel Cell is powered by hydrogen. 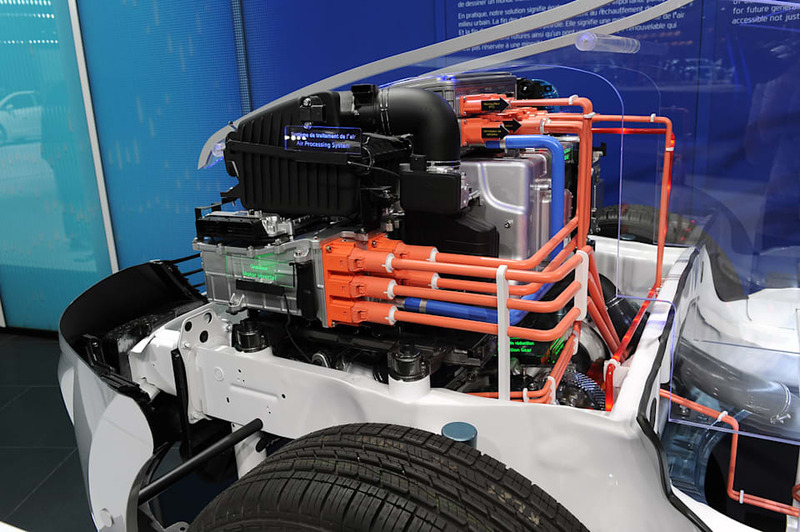 A fuel cell stack converts the hydrogen into electricity, which in turn charges the Lithium Polymer battery that powers the vehicle's electric motor. The only emission generated by the ix35 Fuel Cell is water vapour. The ix35 Fuel Cell is the halo vehicle in Hyundai's Blue Drive sub-brand, the badge worn by Hyundai's cleanest vehicles, including Sonata Hybrid, i20 Blue Drive and BlueOn, Hyundai's battery-powered i10. As governments around the world step up regulations to reduce carbon output and fossil fuel dependency, zero-emissions mobility solutions such as Hyundai's ix35 Fuel Cell will become a driving force of change. The ix35 Fuel Cell aligns with the 2009 agreement by the European Union's G8 countries to reduce carbon emissions by 80 percent by 2050 and California's Zero Emission Vehicle regulations. Hyundai's ix35 Fuel Cell boasts drivability and performance similar to that of the petrol ix35. 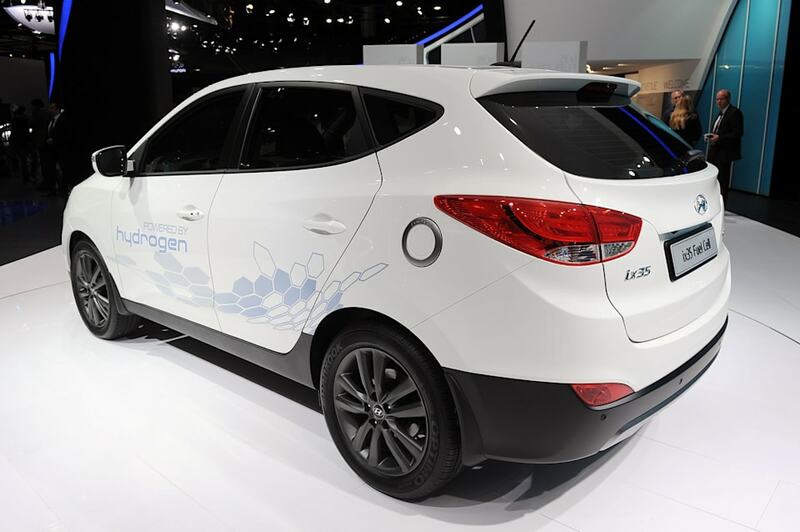 The ix35 Fuel Cell can be filled with hydrogen in only a few minutes. It accelerates from zero to 62mph in 12.5 seconds, has a top speed of 160km/h (100mph) and can travel 588km (365miles) without refuelling. Hyundai chose its popular ix35 as the first vehicle for its fuel cell technology. The ix35 is Hyundai's second-best-selling car in Europe, behind only i30, and was one of the first to display Hyundai's award-winning Fluidic Sculpture design identity. Hyundai is encouraged by the actions of several governments, especially in Europe, that have created detailed roadmaps for building a hydrogen infrastructure and are providing necessary funds. Hydrogen fuelling stations exist in several European nations and additional ones are being built and planned. Expansion of fuelling stations is also anticipated in Korea and California, and Hyundai will supply its ix35 Fuel Cell to public and private fleets there, as well. As a true zero-emissions vehicle, the Hyundai ix35 Fuel Cell is a powerful partner for public and private fleets that want to eliminate carbon emissions. Hyundai's ix35 Fuel Cell is currently participating in the European Hydrogen Road Tour, organised by the European demonstration programme, H2moves. The Road Tour is a multi-city, pan-European display of hydrogen fuel cell vehicle technology, which has stopped in Paris during the motor show. Members of the media and the public are welcome to drive the Hyundai ix35 Fuel Cell at the Road Tour display. 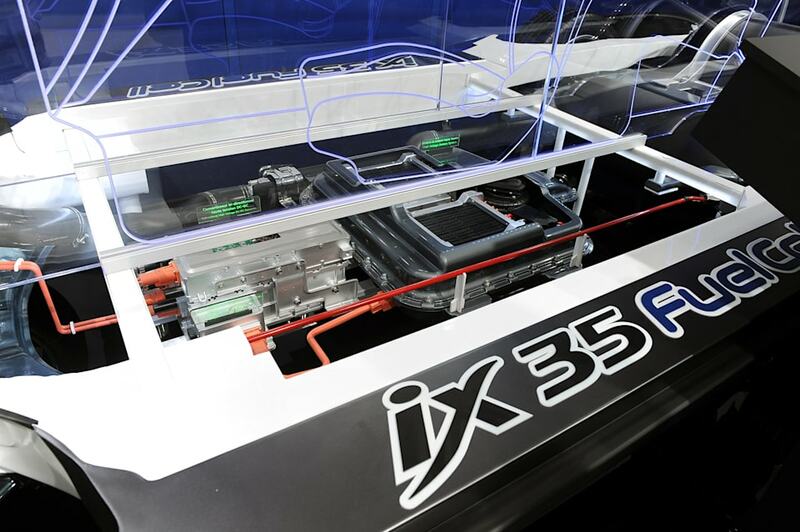 Test versions of the ix35 Fuel Cell have already received both acclaim and significant day-to-day use. The ix35 Fuel Cell was selected as a test-drive vehicle for members of the European Parliament in 2011. Hyundai fuel cells and ix35 Fuel Cell vehicles provided power and transportation for the 2012 Yeosu Expo in Korea. The ix35 Fuel Cell is the result of 14 years and significant financial investment in research and development by hundreds of engineers at Hyundai's fuel cell R&D centre in Mabuk, Korea. The car has logged more than 2 million miles of road tests in real-world conditions in Europe, Korea and the U.S. In early 2012, a Hyundai ix35 Fuel Cell set a range record for hydrogen cars by driving from Oslo to Monaco using only existing fuelling stations. Hyundai Motor Group Chairman Mong Koo Chung has made the fuel cell programme a top priority for the company, leading its efforts to produce eco-friendly mobility solutions and be a responsible corporate citizen. The ix35 Fuel Cell is not only the most advanced eco-friendly vehicle produced by Hyundai, it is a working vehicle ready to stand the rigors of daily use in public and private fleets. From a driver and passenger viewpoint, the ix35 Fuel Cell is barely distinguishable from its conventionally powered cousin. The only difference drivers are likely to notice is the absence of engine noise, thanks to the ix35 Fuel Cell's whisper-quiet electric induction motor. Hyundai's downsizing of its proprietary fuel cell stack enables the ix35 Fuel Cell to accommodate five passengers with comfort. A fill-up at a hydrogen fuelling station takes only a few minutes − just like the petrol-powered ix35. With a range of 588km (365 miles), the ix35 Fuel Cell eliminates "range anxiety" often associated with alternative-fuel vehicles. The new Hyundai ix35 Fuel Cell has received an exterior makeover, with a new grille and other design touches that distinguish it from its predecessor test vehicles. Inside, the ix35 Fuel Cell has received a significant upgrade. The fuel economy and range have been improved by 10 percent over the previous-generation model. 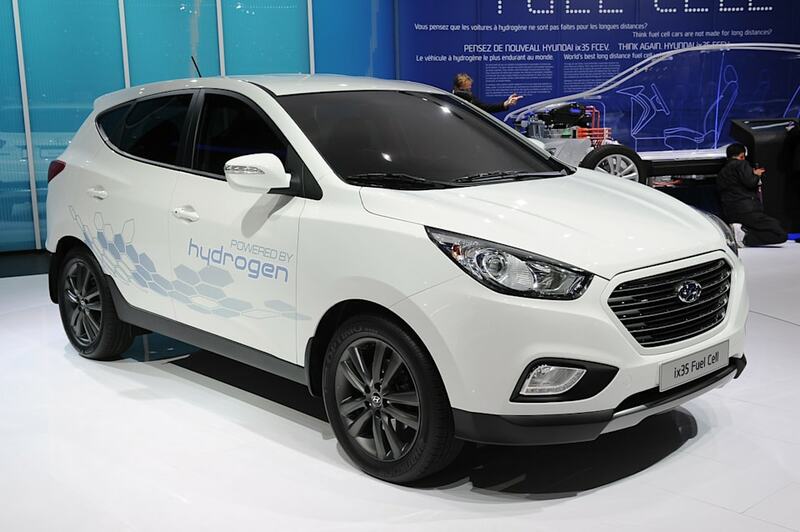 Internal systems have been additionally modularised so the ix35 Fuel Cell can be easily manufactured on a conventional assembly line at Hyundai's Ulsan facility. Most importantly for motorists, the new ix35 Fuel Cell has been tuned for the demanding preferences of European drivers, with improved handling and driving dynamics. Hyundai's ix35 Fuel Cell has unique operating features that set it apart from its competitors. Unlike other fuel cell vehicles that use compressed air to supply oxygen to the fuel cell stack, Hyundai's ix35 Fuel Cell uses ambient air. This reduces parasitic loss in the oxygen supply, raising fuel efficiency and reducing power consumption by 50 per cent. For passengers, the elimination of an air compressor reduces noise inside the cabin. In addition to the fuel cell stack, the ix35 Fuel Cell uses the same lithium-polymer battery found in the Hyundai Sonata Hybrid. A kinetic energy regeneration system charges the battery when the driver applies the brakes or drives downhill. The ix35 Fuel Cell is equipped with stop/start technology, which shuts down the fuel cell stack and relies on battery power only when the vehicle is idling, minimising energy loss in city driving. The ix35 Fuel Cell combines all of the drivability, styling and features of Hyundai's popular ix35 and adds a powerful bonus: zero emissions. Hyundai's fuel cell programme is based at its Eco-Technology Research Institute in Mabuk, Korea, about 45 minutes south of Seoul. 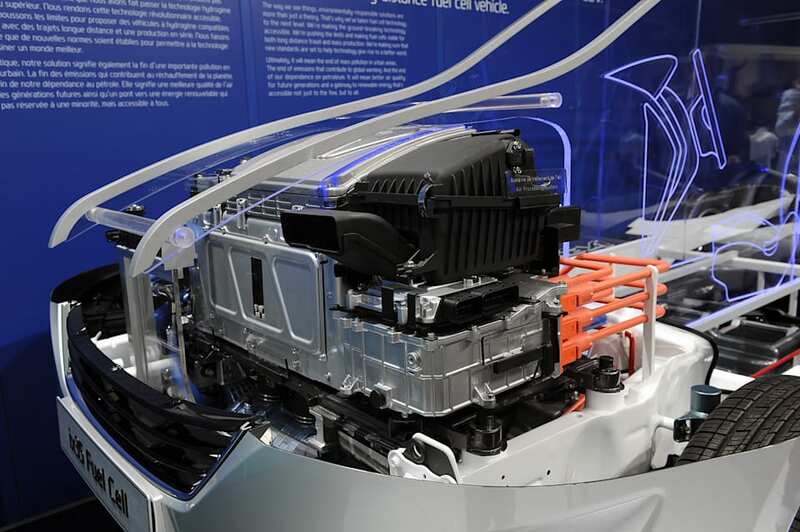 The centre represents the leading edge of Hyundai's eco-friendly power train research. The energy-saving LEED-certified research centre has its own hydrogen fuelling station and manufactures its fuel cell stacks in-house. The programme was launched in 1998 with a roadmap targeting series production of fuel cell vehicles by the end of 2012 and consumer sales by 2015. "The mission of the Mabuk research centre is to create commercially viable, zero-emissions vehicles," said Dr Tae Won Lim, Managing Director of fuel cell R&D. "The ix35 Fuel Cell achieves that goal, providing a clear choice for public and private fleets." Nice to see that Hyundai's not lying on their laurels and stagnating. The Ford Edge ST may be getting some serious competition. The Hyundai Veloster N is one of our favorite hot hatchbacks on sale today and a great introduction to the N Performance brand in the United States. While we await a high-performance halo model, Hyundai aims to place the N badge on one of its SUVs. We initially thought the Kona would be a prime candidate for an N-branded SUV but now it seems like the Tucson will be the next performance model from the N division. The final specs of the car are still a secret but you should expect to see at least 340 horsepower and a 0-60 mph time of under six seconds. Hyundai insiders revealed they are "not interested in making also-ran cars with N badges on them in whatever class they compete”. If that 340 hp figure is correct, the Tucson N will easily be one of the most powerful crossovers in its segment. Yup you read that right. Hyundai has some big performance goals for the Tucson, since it has confirmed that it’s working on a Tucson N, which will be the next model from its new N performance sub-brand. According to Auto Express, the Hyundai Tucson N will arrive in about two years, which means that it will debut before the next-generation Tucson. Hyundai is keeping most of the details under wraps, but we do know that it will have around 340 horsepower, which could turn the Tucson into a poor man’s Porsche Macan.